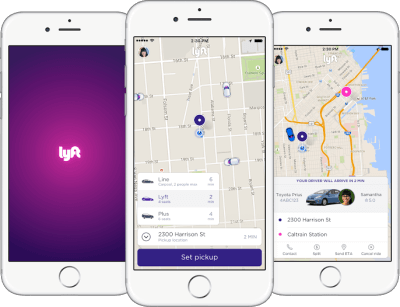 Lyft is an on-demand transportation network company which allows you to hail your own private car service with the tap of a button through a smartphone app on your phone. Once you request a ride, a nearby driver will soon be en-route to your pickup location and will typically pick you up within minutes & will take you anywhere you need to go! There are currently 334 metropolitan areas in the U.S and Canada where Lyft is available. Tons of expansions are planned for the rest of this year alone. As of November 13th 2017, Lyft has made way to Canada - the first country expansion. To start using Lyft, first you must download then install the app on your iPhone or Android. Simply click one of the direct links listed below or you can search for it in your app store. You also have the option to receive a text message with a direct download link. To do this, simply enter your phone number here. Signup with this promo to get $20 worth of free rides! Or enter code YOUR50 in the Payment tab. Open up your app! You'll be prompted to either signup or login to an existing account. If you've already signed up, you can login to your account with the credentials used in the signup process. You can also signup or login by simply connecting through your Facebook account (optional). Lyft revolves around being a cashless environment - being able to hail rides regardless of whether or not you have cash in your wallet. To do this, you must connect atleast one valid credit card or PayPal account to your Lyft account/profile. To do this you need to navigate to the Payment tab in the app. It's located under the menu. Tap the icon in the top-left corner to toggle your menu. If you are still unsure about how this all works - or how exactly you request a ride after you've installed the app and it's ready to go - we are here to hopefully clear things up a bit! Here are some of the most common things people need help with along with their answers. Are you ready to request your very first ride? Here are the necessary steps that you need to take to make it happen - granted you have completed all of the above initial steps and you're now signed in to your account. Make sure that your pickup point (it's a small blue circle) is placed at your current location. Is it off? You can drag the pickup point to the exact location or tap the address in the white box above the Set Pickup button to manually input an address or location instead. The default car service is a standard Lyft. Have more than 4 people including yourself? Tap Lyft Plus to be picked up in an SUV that can hold up to 6. Do you see Lyft Line? It's only available in a small handful of cities - it's ideal if you're by yourself & looking to save money. Do You Tip The Driver? Tipping is not required when riding with Lyft. However as you can imagine, drivers really appreciate any & all tips they receive. After your ride finishes, you'll be given a chance to include a tip with your fare. You'll be able to rate your driver and overall ride experience at this time as well. The cost of your ride will be charged to the payment option on your account. If you choose to tip the driver through the app, the tip will also be charged that same payment option. Cash tips are just as welcome & appreciated!